Like in any other product, commercial aircrafts eventually will end their working life sooner or later. In many cases the owners and operators decide to withdraw the aircraft from service due to increased airplane maintenance cost, the need for expensive airframe and avionics upgrades, difficulty locating replacement aircraft parts, and increasing number of service expired aircraft parts. Once the decision is made to retire the aircraft, the owners face the challenge of finding a new operator or owner for the retired airplane. Currently many aircraft operators and airlines store their end-of-life aircraft as these airplanes are taken out of service. 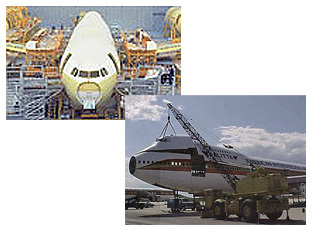 Aircraft storage, however, is expensive and the costs are increasing while the aircraft value will be decreasing as more aircrafts are retired, dismantled, parted out, and recycled. Aircraft owners and operators can experience significant cost savings by planning for aircraft dismantling before the aircraft end of life is reached. Aircraft teardown and sale of valuable recycled aircraft parts and reusable components in a timely manner can in many cases lead to generating more value for the out of service aircraft as compared to its value if put back to service after a long period of storage. It has been demonstrated that up to 80 percent of an aircraft's parts could be re-used, recovered or recycled in a secure and environmentally sensitive way. Aerosup offers free consultation from the early stages of aircraft retirement decision making and assists the clients with creating business plans which would best fit the needs and objectives of aircraft owners and operators. We offer comprehensive end of service aircraft management solutions that would maximize the cash flow and profitability of our customers while reducing the overhead costs. At Aerosup we have the expertise and experience to dismantle airplanes and recycle aircraft parts and components in an environmentally conscious manner.